Review of "POST-DIGITAL: 800 LBS. 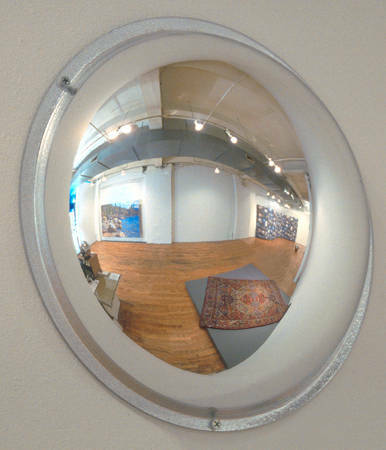 OF PIXELS"
Devorah Sperber, view of installation as seen in a convex viewing hemisphere. (Foreground) Lie Like a Rug, 2000-2001, 18,000 Letraset marker caps on canvas, 99 x 63 x 6 in. ; Reflections on a Lake, 1999, 5,760 spools of thread, 6 x 10 ft.; Virtual Environment 1, 1999-2000, 20,000 spools of thread and 36 convex mirrors, overall dimensions, 21 x 8 x 8 ft.
Sperber takes small modules or units of industrial production denoting the detritus of society and builds them into fantastic installations of visual aggregation and multiplicity. Mimicking old four-color reproduction, television, and contemporary computer imagery, she uses a special computer program to scan landscape photography into pixilated digits. These are blocked as coded color squares, which can be matched with a suitably toned industrial module. Viola! A sculptured mural of weight, gravity, and lyricism. The bridging of cheap industrial materials and epic size, scale, and a visuality lends Sperber's work a unique high/low impact not easily forgotten. The title piece, Virtual Environment (1999-2000), is composed of thousands of spools of thread. The image of a rural rock wall coalesces with the aid of the viewer's perception. It evokes 19th-century pointillist techniques, as well as the fractal, incremental nature of our own era. Color luminosity and richness of tone exist within the thread itself, yet they also serve as the equivalent of an abstracted brushmark loaded with pigment, the signifier of that planar form of expression, illusionist two-dimensional panting. A smaller piece, Reflections on a Lake (1999), mimics the richness of Virtual Environment 1 by employing an Alpine mountain scene as a motif. The clichéd subject matter, in no way elevated from its hack photo-journalist origins, easily presents its own shadow image-this being a neo-Romantic sublimity orchestrated for spiritual uplift and respite. In Sperber's world, the finished statement is always tethered and moored to the means of industrial production, a lowly symbol of waste, ecological imbalance, and anti-nature. It also reflects the technology that so easily dispensed with the Romantic worldview of rugged individualism and the sublime.